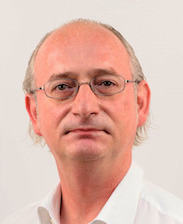 Stefan Matile is a Full Professor in the Department of Organic Chemistry at the University of Geneva and a founding member of the National Centre of Competence in Research (NCCR) Chemical Biology and the NCCR Molecular Systems Engineering. In 2010, he became an ERC Advanced Investigator. He is the co-author of more than 290 publications, many in top journals (53 JACS, etc), and has delivered more than 260 lectures all over the world. About half of the more than 100 junior researchers he has trained so far (PhD, postdoc) are now active in academia (China, France, Germany, India, Italy, Japan, Spain, Switzerland, USA, etc); others preferred a career in industry (Firmenich, Nestle, DuPont Geneva, Siegfried, BASF, Roche, Novartis, JT, etc), or elsewhere. Educated at the University of Zurich (PhD, with Wolf Woggon) and Columbia University in New York (postdoc, with Koji Nakanishi), he started his independent academic career as an Assistant Professor at Georgetown University, Washington DC, before moving to Geneva. At the interface of synthetic organic, biological and supramolecular materials chemistry. Emphasis is on functional supramolecular chemistry, synthetic supramolecular systems in action, at work. López-Andarias, J.; Bauzà, A.; Sakai, N.; Frontera, A.; Matile, S. "Remote Control of Anion-π Catalysis on Fullerene-Centered Catalytic Triads," Angew. Chem. Int. Ed. 2018, 57, 10883-10887. Benz, S.; Poblador-Bahamonde, A. I.; Low-Ders, N.; Matile, S. "Catalysis with Pnictogen, Chalcogen and Halogen Bonds," Angew. Chem. Int. Ed. 2018, 57, 5408-5412. Humeniuk, H. V.; Rosspeinter, A.; Licari, G.; Kilin, V.; Bonacina, L.; Vauthey, E.; Sakai, N.; Matile, S. "White-Fluorescent Dual-Emission Mechanosensitive Membrane Probes that Function by Bending Rather than Twisting," Angew. Chem. Int. Ed. 2018, 57, 10559-10563. Chuard, N.; Poblador-Bahamonde, A. I.; Zong, L.; Bartolami, E.; Hiltebrandt, J.; Weigand, W.; Sakai, N.; Matile, S. "Diselenolane-Mediated Cellular Uptake," Chem. Sci. 2018, 9, 1860-1866. Derivery, E.; Bartolami, E.; Matile, S.; Gonzalez-Gaitan, M. "Efficient Delivery of Quantum Dots into the Cytosol of Cells Using Cell-Penetrating Poly(disulfide)s," J. Am. Chem. Soc. 2017, 139, 10172-10175.